The Tax Planning Presentation for FY 2013-14 – Tax Planning: How to Save Taxes for FY 2013-14 (AY 2014-15) was huge success. It was one of the most viewed presentation on Slideshare and had more than 3 Lakhs downloads from this site. The presentation below incorporates the above changes. The New Modi Government at the center would be presenting budget 2014 sometime in July and then there might be some changes in the Tax laws. We would be editing this Presentation accordingly. I need a clarification with regards to Meal Coupon (TR & Sodexo). My company taxes me if i take more INR1100per month but as per your deck it should INR2200. So could you please explain me or provide me the souce which of this amount so that I can forward that to my payroll team. There are no set rules. It just says you can provide free meal coupons. Now if the company assumes that they are paying Rs 50 per meal for 22 working days and for one meal only, the amount comes out to be Rs 1100. Some companies can assume 2 meals and the amount comes out to be Rs 2200. It depends more on company policies and timings. I read,watch & try to understand the Tax Planning conveniently. This is very useful to me. Thanking You. 🙂 Feels good when you feel it useful! 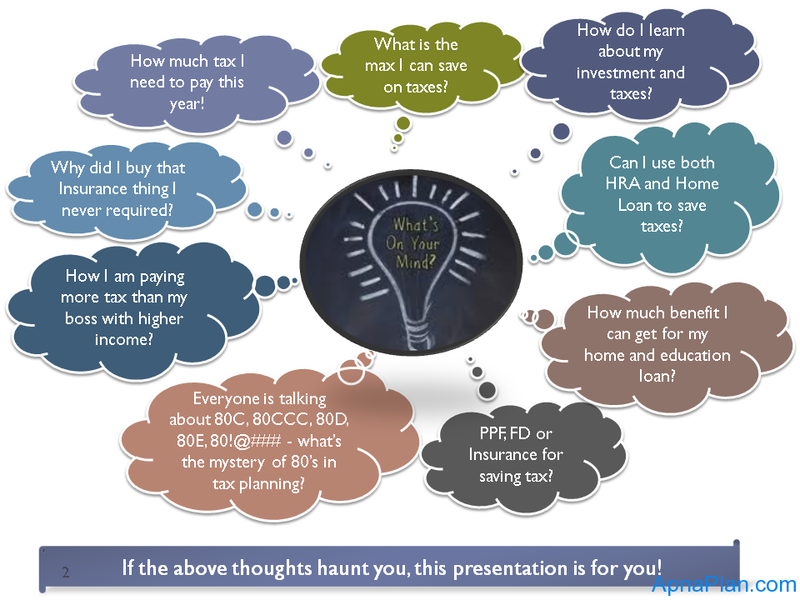 Can you please tell us when you will be posting the Tax Planning for FY: 2015-16? Very nice presentation. Also the Income tax calculator. Do you also have income tax calculator for professionals and service providers? If not, will you please create one and post it? Also it will be a good idea to provide tips to the professionals who are working independently as professionals on how to calculate income tax and how they can plan for retirement. Income tax for professionals are much more complex though they also have better chances of saving more taxes! I would try to do further research on the topic and post on the blog!